Welcome to this week's edition of Frugal Friday. Can you feel it?? Are you excited for the frugal goodness?? Life at Fire Lake Camp. Check out this FABULOUS hanging bed. One of these days I'm going to have a hanging bed. Love. it. I am so impressed by this kitchen at The Vintage Farmhouse. Talk about frugal decorating and blooming where you are planted. I'll say it again, SO IMPRESSED. I've seen a lot of benches made from cribs in my time...but I love this one from a Diamond in the Stuff...wouldn't know it was a crib, if you weren't told. Finally, these sweet easter pillows from Midwestern Sewing Girl make me happy. Just like she said, cute but not too cute. Another fun Friday... thanks again Wendy! Happy Easter! Thank you so much for the feature! I can't believe I was afraid to even share my kitchen!! Thank you so so much for hosting! I so look forward to all the amazing inspiration here! 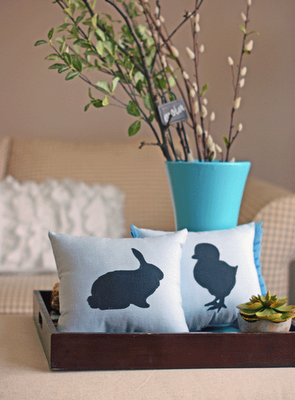 And THANK YOU for featuring my little Easter pillows! I was so excited to see them up!!! Thank you!!! Thanks for hosting, Wendy. Happy Easter! sorry for liniing up twice with the same post. linky tool problems! Yay thanks for featuring my crib bench and thanks for the kind words!!!! Hi I am a new follower. I am happy that I found your blog. You can visit me any time. Hello from Malaysia.I am your new fan. Love your post so much, so inspiring and so much too learn. Thank you for creating such a nice opportunity for all crafty mom to meet. The rhinestone pannent T-shirt is so cool ! Hey! I highlighted that Hanging Bed as well on my blog yesterday! Fun! Thanks for hosting this linky party. I so enjoy looking around! OMG..I'm so glad I found this blog... I think I addicted to it already...so many big finding..so much joy and inspiration... I am trying to see all the post and put in some comments..please host more of this party... I am getting WILD already.LOVE LOVE. Thanks so much! I think I would love to just move into the vintage farmhouse, I was looking for an article on how to clean my washer AND the babes will be done with her crib in a blink. I'm all set now. Thanks for hosting!! In honor of Earth Day i linked up some cheap-o re-purposing we ALL can use!! If you get a sec, pop on over to Little Brick Ranch to enter the Joey totes Earth Day GIVEAWAY!!! #296, I'm a little late for the party! Hopefully : fashionably late ;) I absolutely adore the featured lounge swing! So many ideas here! Love that bench and the pillows. Wonderful features! Thanks for hostessing. Thanks for hosting! Have a wonderful Easter. Thanks for hosting!! I have no idea what took me so long this week but I made sure to link up my most frugal of repurposing ever all in honor of Earth Day! !